Today's Photo Hunt theme is swanky. This past February, I attended the Nipclub Monthly pawty in Monte Carlo, which was certainly trés swanky. I played the field and the slots and had success with both. This foto was taken during a break in the action. To quote two of the songs I played that night, I had my poker face on cos this was my lucky day. I had to go out of town for the Photo hunt cos let me tell you, there's nothing in our condo that's close to fitting the definition of swanky. Maybe if I had a litter box that looks like this, it would qualify. I wrote about these Glitterboxes last March hoping I could convince Pop to buy me one. After he stopped laughing, I learned that my lucky streak was about to end. Would your human buy you a swanky little box like this? That's real gold in case you're wondering. I think you would look stunning in a Glitterbox. Maybe they would let you do a blog review on one. All you can do is ax. That Glitterbox is SWANKY! You would look pawsome in that CK! My very presence says swanky, but I gave up Photo Hunt today for Black Cat Appreciation Day. Hmmmm, I don't see no litter in there, CK. You sure that's what that is??? Darling, YOU are swanky just all on your own! Now that is swanky indeed and with all that gold fit for a stunning cat like you Keisha. Have a super Saturday. My dear, I would call you glamorous! Wow - you are extra stunning in that pic. Swanky - geeesh - not in this house. We don't even know what that word is over here. Mommy would probably ask Grandpa to build us one...cheapskate! Well CK, you always look swanky and your eyes glitter more than gold! The head peep is still laughing at "swanky panky." Humans are so easily amused. We think you would totally rock a swanky gold-leaf glitterbox like that. That's a swanky litter box but it doesn't fit our décor so I don't think mom would buy one for me. Oh, your humans should definitely buy you one of those swanky Glitterboxes!! You look fab with it! My sad little plastic litter box has GOT TO GO. LOVE your swanky post, CK!!!! I like your Swank, CK. Thank Cod I read about the Mackerel setting here last night/early this morning. Our first butterfly emerged and I was able to make the human use the setting on her point and shoot to get WAY better pictures of it than she ever would have otherwise. On Amazon they offer PU leather items. I think that box might be PU swank!! Really! Swanky is largely a state of mind. Or, at least that is what the cats in this house were told. I don't even think I would wanna pee in a glitter box CK! MOL! you look pretty darned swanky to me CK!!!! My GORGEOUS necklace from Robyn!! THANK YOU! I am going to blog about it on Thursday, if I forget to send you the link it is because I will be on my way to BarkWorld on Thursday. Thanks so much for having such a great give-away! You are SO swanky, CK. We can't believe Pop laughed at your request. That Glitterbox is totally YOU!!! 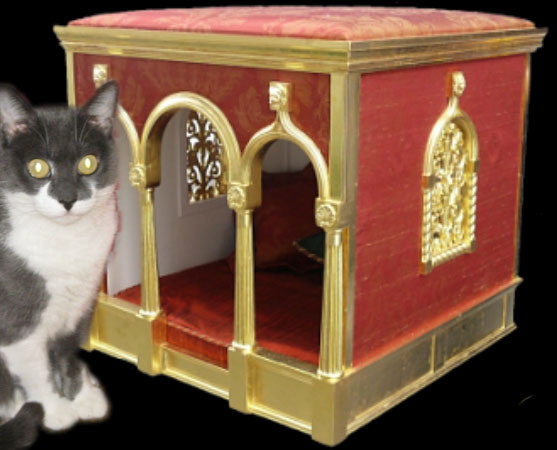 Sadly I don't think I could afford a litter box made with real gold! Meet me on the Blue Pillows? 3 a.m. your time? XOXOXO I've had a boring day--I need a little spice in my life, you know? 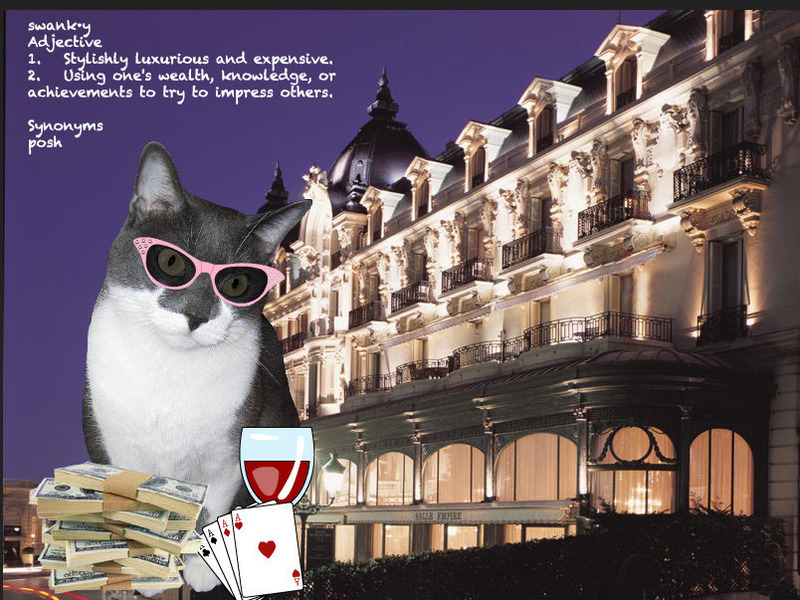 That golden Litterbox looks really swanky adn of course you too CK when you visited Monte Carlo ! CK you are the veritable acme of Swanky! You look cool, you rock as a DJ AND you just SO LOOK the Part.